AXA Commercial Lines and Personal Intermediary is one of UK’s largest insurers, offering insurance on a range of commercial and personal products. The company was dissatisfied with the responses received from their e-newsletters that were sent to brokers on a regular basis. This led to the idea of launching an interactive magazine to connect with brokers. Thus, #CommercialSense, a quarterly interactive magazine was launched in September 2012 with the aim to educate and engage brokers across various digital touch points. AXA Commercial Lines regularly emailed information of insurance products and its benefits in a lengthy newsletter to its clients and brokers. These newsletters reflected a sales pitch and lacked creativity resulting in a very dismal performance. The open rate and click-through rate was quite low. With a new management on board, AXA Commercial Lines decided to reorient their email marketing strategy and bridge the communication gap with brokers. Under the leadership of Delyth Lee, head of marketing and communications, the conceptualisation of #CommercialSense (http://www.commercial-sense.com/v1/) was finalized. #CommercialSense was launched as a quarterly interactive online magazine accessible across all digital devices for insurance brokers covering industry news, insights and latest social media trends. The intent was to offer a feature-packed yet a user-friendly magazine with social media integration, especially Twitter. The tweets would help the brokers to stay updated on latest trends and service announcements. The magazine would carry exclusive expert interviews along with new products and insights put forth by AXA Commercial Lines. Designers worked round-the-clock to design and deliver #CommercialSense with a business-like look and feel and a great degree of interactivity. The response to the launch of the first edition was judged on its target of 20% open rate and 3% click-through rate. The first issue of #CommercialSense was emailed to the brokers on the AXA Commercial Lines database along with its digital promotion. In fact, AXA Commercial Lines was the first insurance company to launch an interactive online magazine which worked out well to its advantage. The results of this launch have been more than satisfactory. Post the launch of 4 issues, #CommercialSense has garnered nearly 28,000 views along with 4,500 unique visitors and 35,000 page views. After the release of the 3rd edition, #CommercialSense registered a 15% increase in its readership. The response to the 4th edition was immense with 535 unique visitors on the very first day of its launch. 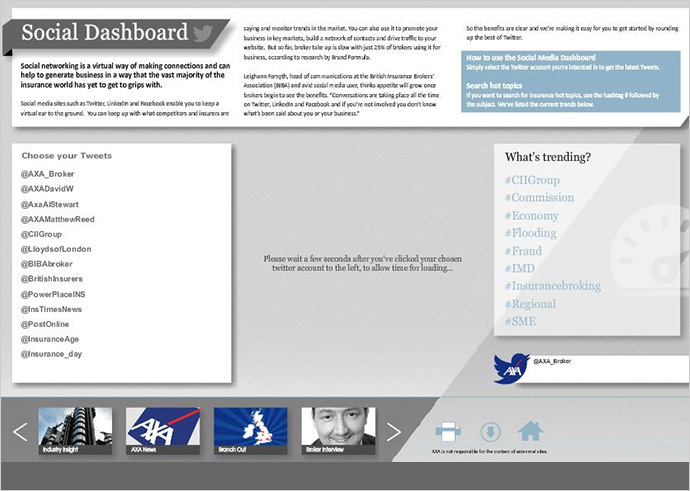 AXA Insurance and AXA Broker accounts have seen a surge of 80% in number of Twitter followers. Likewise, brokers have shared #CommercialSense articles with enthusiasm across various social media channels. These high numbers reflect the acceptance of the campaign amongst its readers. The campaign has redefined the outreach of social media when serving B2B clients. #CommercialSense throws light on out-of-box ideas that can work to bridge the expectation gap between brokers and consumers digitally. Previous Post: How to Manage Your Daily Social Media Activity?